Many of us have an aversion to consultants – they cost so much and they think they’re so darn smart. But then why do we need consultants? Because it’s human nature for us to lose the ability to see our organizations, programs, and plans objectively. We need consultants to point out the obvious to us and develop obvious solutions to our problems. The fact is, if we could develop the ability to see our organizations and plans through fresh eyes every day, and then take time to think about obvious solutions, we would never need a consultant the rest of our careers. Meet Oliver “Obvious” Adams. How can we think about our projects, our work, our teams like an outside consultant? Do we take enough time to step back from our work, think about what the real objective is, analyze the current situation, and identify the “obvious” solution? And then, once we’ve identified it, how can we muster the courage to implement the “obvious” solution? This entry was posted in Books, Effectiveness, Productivity, Success, Work. Bookmark the permalink. 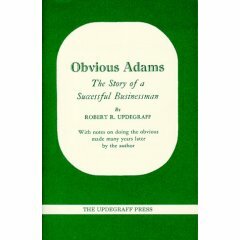 Just a few years ahead of Robert Updegraff, Frank and Lillian Gilbreth wrote “Most of good management is obvious.” Obviously, Updegraff was a student of the Gilbreths.